Rabbi Avishai David: What is Lishmah? Rabbi David Fohrman: Is There a Face Hiding in the Mishkan? Rabbi Dovid Miller: Where is Gemilas Chasadim in the Mishkan? Rabbi Andi Yudin: Torah on the GO! Rabbi Ari Zahtz:Is a Mishkan Ideal? Rabbi Shmuel Goldin: Why Build It At All? Rabbi Avraham Gordimer: Unequal Donations? Rabbi Avigdor Nebenzahl: The Mishkan, Shofar, and Purim - TorahObligations? How Far Do I Have To Dan L'Kaf Zechut? and why is he blessed? As I understand it, the specific situation is a complex one, and we should be careful not to impugn the motives of the individual school administrators or the individual girls engaging in the practice. At the same time, one should not dismiss arguments from those opposing by virtue of the gender of the author ("mansplaining"). That is just an ad hominem. And also one should realize that in the current environment, such a position is going to be an unpopular one, and "shaming" those who propound the position as backwards and ignorant will not aid in arriving at a truthful conclusion. 2) What about Michal bas Kushis (or Michal bas Shaul)? 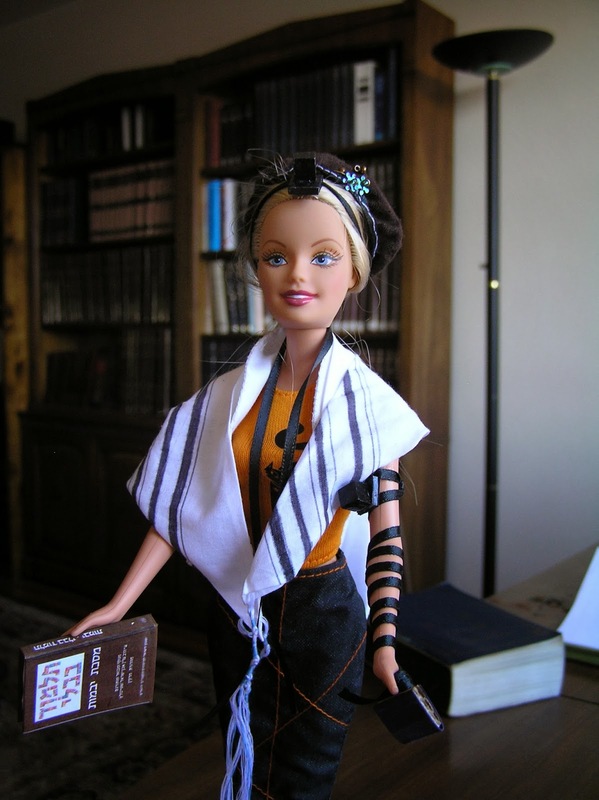 She wore tefillin, after all! This is also the stuff of legend. Be honest, you non-chareidim. Do you think (a) that the historical Michal daughter of Shaul really wore tefillin and this is an oral history, or (b) do you think that it is a midrash which some rabbinic figure came up with, perhaps by close reading of some Biblical passage, and perhaps to teach some important lesson? When the gemara says that she wore them ולא מיחו בידן חכמים, the Sages did not protest, do you think that historically the Sages were around to protest or not protest? Such a tenuous fable was not sufficient in Talmudic times to arrive at a definite halachic conclusion. Rather, the rabbis interpreted the halacha in light of the halachic system they had assembled before them. התיבון הרי מיכל בת שאול היתה לובשת תפילין אשת יונה היתה עולה לרגל ולא מיחו בידם חכמים. רבי חזקיה בשם רבי אבהו אשתו של יונה היא שבה מיכל בת שאול מיחו בה חכמים. That is, Rabbi Abahu holds that (certain) instances of petur from tefillin also establish an issur to wear tefillin. Thus wearing tefillin at night, a time of petur, is also forbidden. And thus a woman wearing tefillin is forbidden. They object from this midrash, and they cavalierly rewrite the midrash. How do you know the Sages didn't object?! Since we know it is forbidden, say they objected. 3) Even if there is halachic basis for an action (at the same time that there is solid halachic precedent against the action), that does not mean that every praiseworthy action should be taken. No, this is not (entirely) impugning the motives of women wearing tefillin, in a way that we do not subject men to such scrutiny when they accept some extra practice. Rather, it is recognizing that historically, praiseworthy actions have been abandoned by the Jewish people in the face of outside groups co-opting it. If I got up in shul and tried to establish that they publicly recite the Aseres Hadibros every day, people would object, I think / hope. Even though this was the practice in the Beis Hamikdash. Why? מפני תרעומת המינים. Rambam objected to standing up specifically when the Aseres Hadibros was read (though this is admittedly and unfortunately current practice). They used to decorate shuls with foliage for Shavuot (and still do in my shteible), but the Vilna Gaon tried to get it nullified when Christians had a similar practice, and many shuls no longer do it. Even though the avos offered sacrifices of matzeivos, because pagans did so, this practice was later Biblically rejected. Certain actions which otherwise would not have been considered optimal were taken להוציא מלבן של צדוקים. And like it or not, there are other current sects of Judaism which, in the interests of egalitarianism (and which believes that Orthodox Judaism has been treating women unfairly and unequally) has established the practice of women wearing tefillin. If so, it is not a simple appeal to rare historical precedent or finding classical sources which permit or encourage it. Rashi's daughters, had they worn tefillin, did not do so when there was a competing sect promoting the wearing of tefillin. So too for Michal bat Shaul. So too the Rashba. Were the Rashba alive today, he would not just read the dry texts, but also realize that the same act hundreds of years ago does not have the same meaning as it has today, and he could very likely forbid. Again, this is not to judge the motivations of the specific identified individuals involved. But the actual facts on the ground legitimately brings in the question of sectarianism, and maybe even a call to question motives in general. 2. Is daber exclusively strong, harsh language? According to Baal Haturim, it implies conciliatory language. 1. Terumah sources, 2012 edition -- updated and improved. 2. I 'sleep', yet my heart waketh -- according to the Meiri, with an interesting Freudian interpretation of the poles of the ark. 4. Beating baby rams for the cover of the Mishkan -- Why doesn't Rashi suggest that that is what וְעֹרֹת אֵילִם מְאָדָּמִים means, if the Yerushalmi explains it in this manner? Rav Chaim Kanievsky asks and answers. And I give my own explanation. 5. Beating baby rams, continued -- Presenting the Chasam Sofer on that Yerushalmi about beating baby rams for the red-skinned ram hides for the Mishkan. 6. Multiple techashim in the time of the midbar -- Which then resolves the question of where the shoes in Yechezkel came from. 7. Oros Techashim as humorous words -- An interesting thought by Rav Levi Yitzchak of Berditchev. 8. The trup on וְעָשִׂיתָ מִכְסֶה לָאֹהֶל -- Shadal generates the alternate cantillation, based on Rabbi Yehuda's position, mentioned in Rashi. Teruma sources -- further expanded. For example, many more meforshei Rashi. Why I am in favor of murex trunculus techelet. Part one and part two. Should one study secular subjects, independently of Torah? Is the Maharsham correct that a talmid chacham should gain all secular knowledge from Torah, parallel to the menorah which was beaten out of one piece of molten gold? The extra vav that wasn't -- As it appears in Rashi, Ibn Ezra, and Chizkuni. See also this earlier post, by the same title. How does Onkelos translate Tachash? A strange word. Is it an animal or a color? How does *Rav Yosef* translate Tachash? We saw in the previous post that sasgona is sky-blue. Did Rav Yosef, the expert Targumist, get this wrong? There are numerous other difficulties with the gemara, especially when compared with the parallel Yerushalmi. This post presents an admittedly extremely speculative reconstruction of the original sugya, in which a number of issues are resolved, and tala ilan becomes kala ilan. All who add, subtract -- How to understand a gemara in Sanhedrin, about a pasuk in parshat Trumah. The well of Miriam, miraculously growing acacia trees -- An interpretation from Baal HaTurim, of trees growing wherever they went, conflicts with a midrash that Yaakov needed to plant acacia (or rather, cedar) trees for the mishkan. Can we resolve the contradiction? Are the Samaritans right about the spelling of תיעשה? Of course, it would not just be the Samaritans, but various masoretes masoretic texts as well. And it is possible that the malei spelling stems from misunderstanding a midrash. What was bothering Rabbi Yosef Ibn Caspi? Continuing the conversation on a post in Mishpatim. How Rashbam differing from Chazal is not the same as Rashi differing from Chazal. And considering how Ibn Caspi onegrof would potentially argue with the conclusions of Chazal. Mishpatim -- "Then his wife shall go out with him" -- when did she enter servitude?! What does it mean that his wife goes out with him? When did she go into servitude? According to established halacha only a minor girl can be a maidservant. Thus the (perhaps midrashic) explanation that this means that the master is obligated in her support during the duration. To bolster the idea, I would note that the function of pasuk 3 is as the general principle spelled out in more detail in pasuk 4. That is, there is a different type of wife his master may give him, namely a slavewoman. Such a woman is not his real wife but just functions as a breeder for permanent slaves. And so he must leave this wife, and by explicit extension, his children, to his master. However, if he comes in to servitude with a wife already, any children born to him during this duration are his own and are not slaves. And his wife is obviously his wife. It is still not absolutely precise, since it gives the implication that in the duration of his servitude, his wife has the status of slave. But it might be argued that it is precise enough to convey the intended point. That she doesn't leave him, but is part of the eved's household, during which she gets support, and so she accompanies him as would be entirely expected. If so, the midrash might be argued to be the peshat as well. "If he be the husband of a wife -- according to the peshat, his wife also comes with him into the household of the master, and works in the house. And this would be correct regarding one who sells himself, for he is able to be sold together with his wife. However, according to the position of Rashi and some of Chazal, who explained this parasha regarding one [a thief] who was sold by Bet Din, it is not correct that the wife should be sold for the sin of her husband who stole. And therefore they said "now who brought her in that she should go out? Rather Scriptures is informing that one who acquires a Hebrew servant is required in sustaining the fellow's wife and children." And all this is to increase to trait of chessed and rachamim in Israel. which without a doubt speaks about one who sells himself because of his poverty, Rabbi Shimon said (and Rashi brings him down) that "if he be sold, who sold his children?!" However, the Torah, just as it permits a father to sell his minor daughter, so too permits that he sells himself together with his wife and minor children. And behold it is known that in days of old the father was ruler upon the members of his household and their lives were in his hand (as is apparent from the words of Yehuda, "Take her out and burn her!"). And the Torah cancelled from him this rulership and did not permit the death of the Ben Sorer UMoreh except via the decree of the judges. And so too the sale of the wife and chldren, the Written Torah permitted it, and it was forbidden in the Oral Torah. And further they added (Kiddushin daf 20) that the master cannot assign him a Canaanite maidservant [to procreate with to produce more slaves] unless he already has a wife and children, and this (like the words of my student Moshe Kohen Porto) is because it is not fitting that he father slaves for his master prior to his fulfilling the mitzvah of piryah verivyah and produce children to establish his name in Israel." An interesting approach, in which Oral Law, or perhaps Rabbinic law, functions as a series of further ordinances and reforms on top of the Written Law, extended ideas, values and approaches already present in the Written Law. Perhaps as society progressed? Rabbi Chaim Brovender: Who was the 'Malakh' God Sent? Rabbi David Fohrman: Female Servitude...Wait, What? Rabbi Asher Friedman: An Eye for an Eye? Rabbi Elly Storch: What Parsha is Na'aseh V'Nishmah found in? Rabbi Moshe Tzvi Weinberg: Are We Serving Hashem or Serving Ourselves? Rabbi Netanel Wiederblank: What is the definition of peshuto shel mikra? Rabbi Ephraim Meth: Is there a Place for Logic in Torah? Did Ibn Ezra meet the Rambam?